Kiger Mustangs are wild horses found in southeastern Oregon, US. They are named after their natural habitat, mostly in the Kiger Canyon. They are related to Spanish horses brought to North America during the 1600’s and that until recently, this bloodline was thought to be extinct. As a result of a roundup of wild horses in 1997, the Bureau of Land Management (BLM) identified a group of horses with very similar traits. They were separated and subject to genetic testing conducted by the University of Kentucky which showed that the bloodline is not extinct. Their numbers were estimated in 2013 to be 101 horses in both the Kiger and Riddle Mountain Horse Management Areas. Every 3-4 years the BLM conducts a wild horse roundup and auction off some of the Kiger Mustangs to the public. There is now a Kiger Horse Association and Registry devoted to the breed. 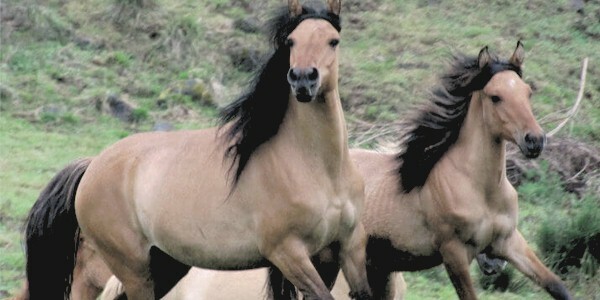 The State of Oregon recently declared the Kiger Mustang a State Horse. Kiger Mustangs have been the model of the typical mustang and readily recognizable in animated films and models of horses. They are most often a dun color but also come in other solid equine colors. They generally stand 13 to 15 hands are compact, agile, and intelligent. They are generally bold but gentle and calm; they are used for pleasure riding, performance competition, and athletic competitions.